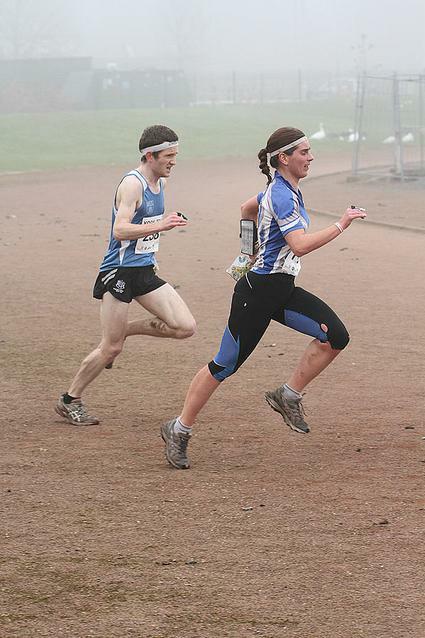 Last weekend brought the British Orienteering Champs to York. These races acted for the Irish as the first of the World Championship Qualifying races. Three CNOC runners headed east to race against the best in GB and see where they stood after a hard winters training. Saturday was the British Sprint Championships. The heats were in the morning with the finals in the evening. Each heat had 40 on the start list with only the top 6 qualifying for the A final. All of the Irish M21 runners were in the one heat, Heat B, Ruairi Short, Gerard Butler, Shane Lynch and Colm Hill. A coincidence? Only Shane Lynch (CorkO) could qualify for the A final finishing in 6th place. Both Ruairi (20th @ +1:20) and Colm (10th @ +14sec) weren't quiet up to pace and missed qualification to the A final. Regina Kelly was CNOC's only female runner and ran in heat C. Sadly, there were some other extremely talented runners such as World Champion Linnea Gustafsson. Heat Results: M21-B, W21-C. In the afternoon, were the Finals. These races were World Ranking Events. Ruairi (21st) and Regina (50th) came away with new WRE Score PB's. Colm came away bitter (whats new) with a 4th place finish and a race that could have being after a blistering second half to the course. With day one done and dusted, it was wrapped up in a small Italian restaurant inside the medieval walls of York. Sunday morning dawned foggy - a common theme of York apparently. Rocking up to the event, it had the feel of a small JK. The warm up map was essential to try get into the veg changes and all the tiny pits. The courses had 0 (zero!) climb on the control descriptions! Flat terrain, rough ground, fast going in places and furious map reading at speed where tiny mistakes were severely punished. Think - a long sprint. Colm and Ruairi both entered the race confident, one being properly orienteering fit for the first time and one with his head in the right space for the first time - there was a calm excitement lingering. "This was fast and very very flat. Overall I'm quite happy with this. I think that running wise I'm closer than I have been and I was the least nervous about any big race than ever before. Had misses on 3,5 and 6 and bad direction on 13. 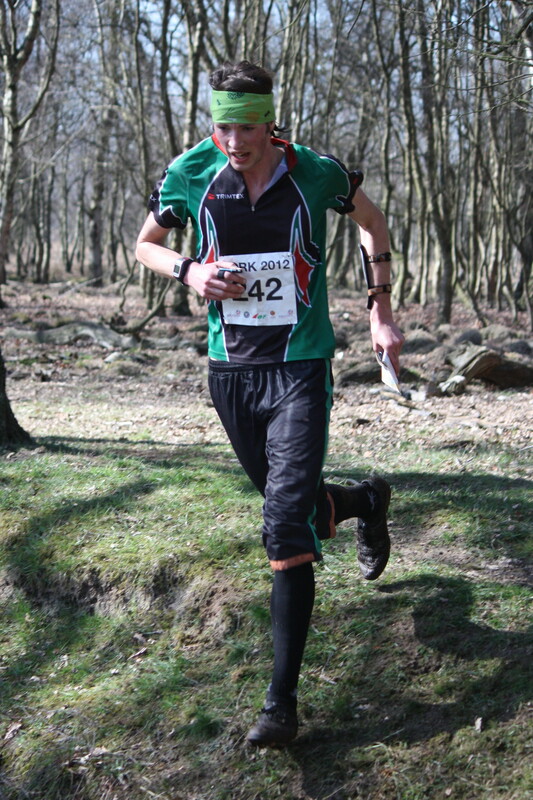 Apart from this orienteering was good and I kept pushing for most of the way, except I died a little at the end." Ruairi finished 35th in 38:04. Map. After the race, Colm just lay on the ground, panting for breath and every now and then, a curse follow by number 20 would escape. "Heading to 20, I miss read the map, saw my control, said thats not mine and continued on... then I realised it actually was. I had to hammer the rest of the course. Its great to be running in such a strong field where every tiny mistake is punished. Really makes one focus on the little things." Colm finished 27th in 36:38. Map. Some success, some failings. Bring on the JK and Round 2 of WOC Qualification. Pre enter for the Leinster League event here! No filling out forms, no queuing to fill out forms! Just rock up, pay and collect your control descriptions - AND the organisers will be happy out for less typing! For those that don't want to pre register, REGISTER your SI CARD NOW anyways! Its that time of year (three months ago) where we need to sort out CNOC membership. A new 2012 membership form has being linked here, on the right under Club Documents and on the right under Club Links. So there are three places for you to click. No excuses. -The best looking O gear on the Irish circuit. -You are eligible to race internationally as you become a member of the IOA. -Free tea/coffee/pint at the AGM where you might be one of the lucky ones to get elected! 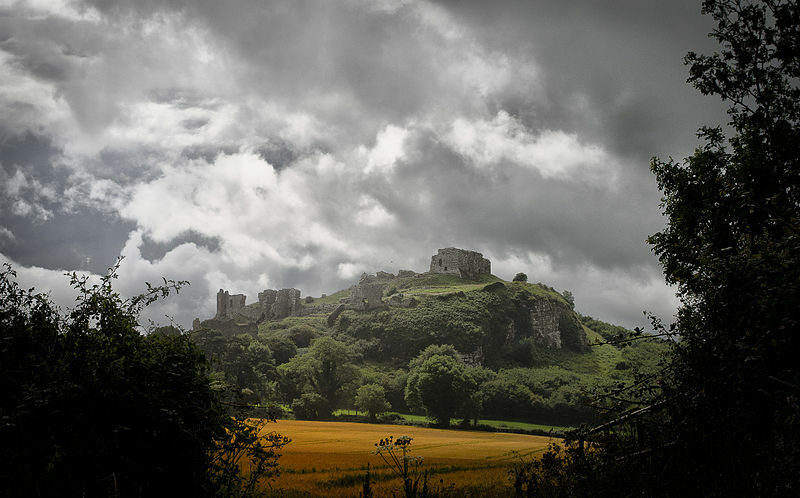 -Access to the CNOC map archive. A place to upload your GPS'd maps too. -You also have the added benefit of when you rock up to an event, people think, "dam it, CNOC have shown up. We won't stand a chance now". So, get your membership in sooner rather than later. 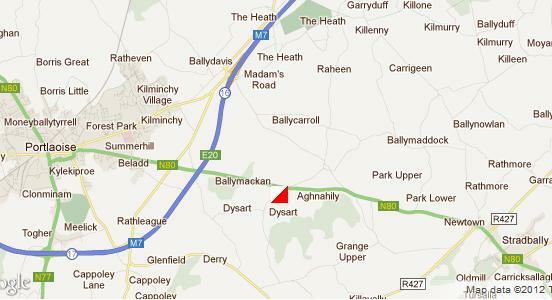 The area is located South of the N80 between Portlaoise and Stradbally. The event will be signposted off the N80. For those travelling from the Dublin take the M7 as far as exit 16. Follow the signs for Stradbally/Carlow which will lead you on to the N80. The forest is located adjacent to the well known Heritage Site of the Rock Of Dunamase, just a few minutes drive from the M7. This is a new area to orienteering. It is a mixed forest with some open areas surrounded by farmland centred on four significant hills. The forest has a large number of limestone features and boulders with significant areas of very runnable forest augmented by a network of tracks and ruined walls. Surveyed 2012 by Oliver Clear (DFO/CNOC) and Pat Healy (CNOC). This is a new map to orienteering. Parking is located in a field adjacent to the start which has kindly been provided by the landowner. A second car park in located just to the North of the Start in the grounds of a farm house. Exit this car park via the wooden gate in the southern fence. This track leads directly up hill to the start. Parking is limited so people are requested to car pool. No parking should take place on the small road that leads to the parking area. Located adjacent to the start in the upper car park. The start is located adjacent to the car park. Starts will be from 1100hrs to 1300hrs. Three down, three to go in the Leinster Spring Cup! Russmore Forest, Brockagh and Glendasan have being swamped by orienteers and so far as good for CNOC runners. 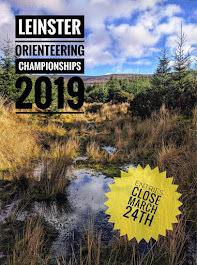 Congratulations must go to CNOC and DUO orienteer Regina Kelly on helping DUO to take the Team Title in the Womens event at the Irish Student Championships that was held in conjunction with the Leinster Spring Cup on Glendasan. League tables and all that jazz can be found here. CNOC's next event is Carrigmeal Forest on the 1st of April. But before that there is a far more serious and energy sapping event to take place. The CNOC AGM! This year’s CNOC AGM will be held in Lumville House, the Curragh, at 21:00 on Tue 20th March. Minutes from last year’s AGM will be available on the CNOC website soon http://www.cnoc.ie/. I've heard that the map is excellent and the planning and controlling is top notch. I'll post the minutes to the site when I get them.